Creme Egg Hunting Season is back – and so are the rare White Cadbury Creme Eggs. 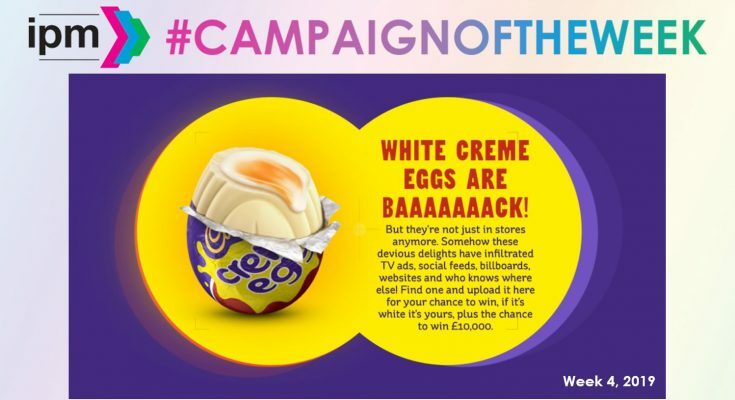 Following on from last year’s launch, this year’s hunt offers fans, not only the opportunity to track down these lesser spotted lovelies in supermarkets, but also in the last places they would expect, as Creme Eggs have infiltrated social media, billboards, websites and the world around us. To celebrate the launch of this year’s campaign, Cadbury has teamed up with Booking.com, the global leader in connecting travellers with incredible places to stay, to hide a secret White Cadbury Creme Egg listing on the site. Those that find the property within Booking.com will discover that for just £9.99 they can book in for a night’s stay in central London with the number one purpose of seeking out the elusive White Cadbury Creme Egg. The Cadbury Creme Egg-filled haven will be kitted out to include a bedroom, bathroom, kitchen and plenty of lounge space. The space is fully equipped to host the most ardent of Cadbury Creme Egg fans for an overnight stay – but most importantly the elusive White Cadbury Creme Egg which could be hidden anywhere from the fully stocked fridge to the living room decorations or even in the bathroom walls. There will be just one opportunity for fans to win an overnight stay in this suite on 1st February and just one White Cadbury Creme Egg available hiding alongside the much-loved classic milk chocolate Cadbury Creme Eggs. The lucky guest will have just hours to hunt it down before they check out. For the chance to win a stay in this ultimate hunter’s paradise, consumers can hunt it down at www.booking.com. There will be more opportunities to win by finding one of the hidden White Cadbury Creme Eggs with other partners between now and 21st April 2019. There are thousands of White Cadbury Creme Eggs and milk chocolate Cadbury Creme Eggs to be found across the UK & Ireland, in addition to those hiding in stores. Clues for where to look and who else is involved can be found at www.HuntTheWhiteCremeEgg.com.